Now that Sarah is happily off the market, I haven't heard many good dating stories lately. Then I realized it's because they are happening to me. Men. Are. Ridiculous. I've yet to meet one that didn't make me go "what????" I think I'll start chronicling my tales here. I hope Colleen joins. She has some good ones too. First up: Josh the Goon. 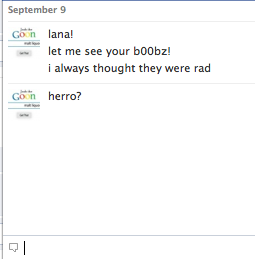 I woke up the other morning to a facebook chat I had missed while sleeping. It was simple and to the point. It was from a co-worker I knew at Urban back in 2005. Let's just say I didn't reply. unfriend. le sigh..